The story introduces us to Bruno, a boy believed to be a half-wit, but one born to a family that could hire a governess to care for him. One night, the governess's house is struck by a bomb by the Allied bombers, which was strange because there were no other house struck and the house did not seem particularly strategic but the governess was killed. A new teacher is hired to work with Bruno and he is told that the boy is excellent with numbers though largely difficult to engage with otherwise. Shortly into his work, the teacher watches Bruno fighting a gang of younger kids when a nearby butcher throws him into the next yard. That night the butcher's shop is also bombed. The teacher was warned that Bruno has his own private study where he likes to go but doesn't like others to visit. Inevitably, the teacher decides to visit this room. He finds Bruno involved in torturing a small animal and is overall suspecious about what he sees in the lab. He leaves and goes to the father to try to explain what he anticipates and decides not to go home that night. That night, the teacher watches a small ballistic leave Bruno's room and hit where he lives. At this point, the teacher and the father go to the local commander, where it is explained that Bruno must have gotten hold of some of the plans that the father, an engineer, was working on for the military. The Major is excited, believing that the boy has managed a breakthrough that no one else has and looks to use him for the war. He goes to Bruno and demands he explains what happens and even threatens him, but the boy does nothing. That night, the boy bombs the Town Hall where the Major is staying, but the Major happened to be in the barracks. He heads right to Bruno's house and shoots him in the head because he would not cooperate. It's at this point that a hail of missiles strike the town, killing everyone in the house. "These words decided the elderly teacher's fate. He had unwittingly stumbled on a secret - the nature of what was being produced in the underground factory. And then, the engineer's son was now more valuable to the authorities than the man who had informed on him. The teacher disappeared into a concentration camp. That was what saved his life in the end." That paragraph is just dropped into the story and we are meant to imagine how the concentration camp could be a saving grace as opposed to a death sentence. Coupled with this is an interesting damning statement about the nature of the Germans warfare tactics made by the mother after she witnesses the Major kill her. Source: The Penguin World Omnibus of Science Fiction. 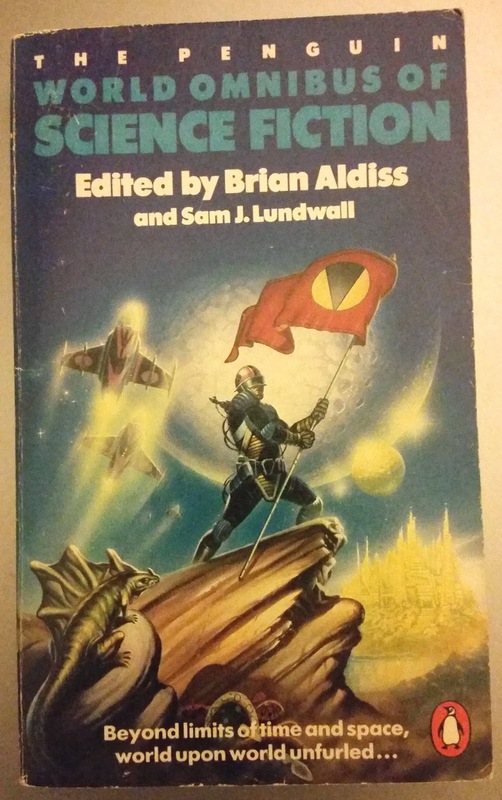 Edited by Brian Aldiss and Sam J. Lundall.